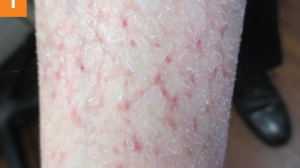 This 28-year-old woman presented with a 2-month history of a rash that was confined to her right antecubital fossa and that had a burning sensation. Her medical history is complicated by a several-month history of interstitial pneumonitis that was being treated with azathioprine and a tapering dose of prednisone (now down to 10 mg daily). 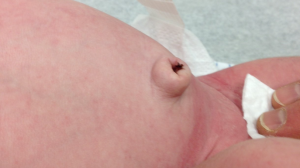 What is causing the rash on this woman’s inner elbow? 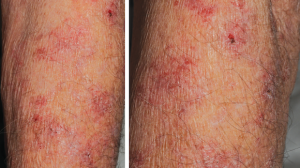 A diagnosis of psoriasis was confirmed by biopsy results. 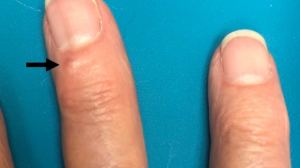 The patient was placed on rotational therapy with a potent topical corticosteroid and topical calcitriol, which resulted in complete clearing of the lesion. 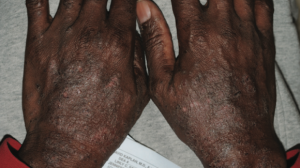 She did not have psoriasis lesions elsewhere on her body. 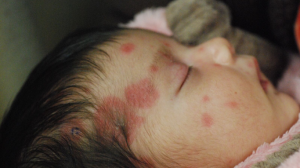 All of the other conditions listed (atopic dermatitis, dermatophyte infection, impetigo, and contact dermatitis) are reasonable differential diagnoses; the decision to do a biopsy also was reasonable. 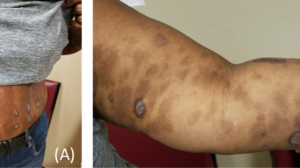 There is no explanation for the asymmetric appearance of this patient’s psoriasis lesion, although her pharmacotherapy regimen of azathioprine and prednisone for interstitial pneumonitis probably was responsible for the atypical presentation of psoriasis. 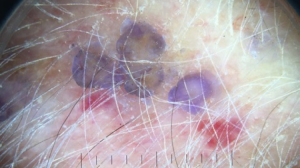 David L. Kaplan, MD, is a clinical assistant professor of dermatology at the University of Missouri–Kansas City School of Medicine in Kansas City, Missouri, and at the University of Kansas School of Medicine in Kansas City, Kansas. He practices adult and pediatric dermatology in Overland Park, Kansas. 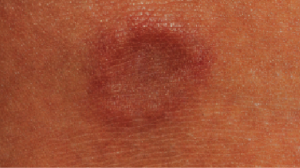 What is responsible for this flare of psoriasis?